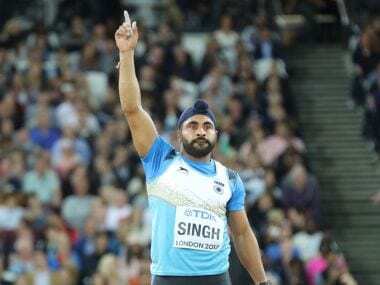 After two throws – 82.22m and 82.14m, Davinder Singh Kang was staring down the abyss. He prowled around the throwing arena with his mind racing. He needed a good throw. Kang hadn’t come all this way to the World Championship to throw three times and pack his bags. The shoulder felt sore. In the afternoon, he had taped it up. Then again in the evening before his group walked into the Olympic Park. Sitting on the bench was Sri Lankan thrower and his close friend Waruna Rankoth Pedige whose first throw was a poor 73.16 and the second and third a no-throw. Kang went over to him and asked him to press his sore shoulder. Waruna pulled Kang’s shoulder a little wide, releasing tension and freeing the tightly-bound muscles. Feeling better, Kang picked up the javelin and was back on the runway. This time the run was smoother and the momentum unlike the previous two had more rhythm as Kang bounded in and leaning slightly to the left let it rip. The spear had a good trajectory and for a second, looked like it would dip earlier, ahead of the magical 83m qualification mark. But the speed of the release had been better – Bang - Kang had thrown 84.22m. For the first time in the history of Indian athletics, a javelin thrower had made it to the final of the event. “The first thing I did was say thank you to him (Waruna),” said an elated Davinder. India’s campaign in the javelin was to pitch-fork it’s two throwers into the final, creating a sort of record in Indian athletics. And when Germany’s 24-year-old Johannes Vetter threw a monster of an opening effort of 91.20m, it felt that the other throwers now had a marker. India’s Neeraj Chopra, introduced to the crowds as the Junior World Champion loves a challenge and Vetter’s throw was the ideal potion for both Chopra and Davinder Singh Kang who was to come in later in Group B.
Neeraj Chopra, tipped by many to be a future podium finisher at the Olympics and World Championships couldn’t quite pick up rhythm. His first throw of 82.26 gave the impression of being tantalisingly close to the qualifying mark but physically he wasn’t moving well. And the second throw was poor – the release speed plus the 8-10 steps taken for final release didn’t quite match-up. Just before the release line, Chopra stuttered, killing the trajectory. It was a no-throw. Chopra kept muttering to himself that it was only 83m and that he should do it quite easily, he would say later. The third throw a poor 80.54m pushed him to 7th in Group A. Chopra’s fate now hung in the balance and depended on the ‘poor form’ of the throwers in Group B. Meanwhile, after Vetter, Tero Pitkamaki of Finland, Ahmed Bader Bagaour of Qatar and Kenyan Julius Yego wrapped up their work with a single qualifying throw. Apart from Vetter’s 91m plus, two throws went beyond 86m, two more than 85m, another two crossed the 84m mark and then six of them made it to 83m and more. Chopra looked gutted when he couldn’t piece the reason for the below-par performance. “The conditions were all okay,” he said. “But there was an issue technically which I can’t put my finger on.” He seemed puzzled and unable to comprehend what had gone wrong. Even the Indian camp under deputy chief coach RK Nair had unabashedly plumped for Chopra over Kang. “We believe that there is a possibility of Chopra being on the podium while both can be in the final,” said Nair, a day before the qualifying rounds. Speaking on technical issues, Chopra did say that there was nobody to discuss it with when he realised that the second throw had been disqualified. “I knew there was something wrong,” said a worried Chopra. “But I couldn’t do anything about it. I have been in competitions for the last 3-4 months and there has been no time off to train and look at the technical points. I hope that we get a coach soon and then we sit down and figure out the weaknesses.” In previous World Championships, Chopra’s throw of 82.26m could easily have won a place in the final. But it was group B where most of the throwers went past the qualifying mark. Chopra’s dream of entering the World Championships final would have to wait for another two years. After Hoffman and Rohler had qualified, the other five from Group B were Petr Frydrych of the Czech Republic with a season’s best of 86.22M, Trinidad’s 2012 Olympic champion Keshorn Walcott with 86.01m, Loannis Kiriazis of Greece with 84.60m, Czech Jakub Vadlejch with 83.87m and Estonia’s Magnus Kirt with 83.86m. It has taken Davinder Singh Kang 16 years of efforts and participation in various competitions to finally reach a World Championship final. “I will surely put in my best in the final,” he said. 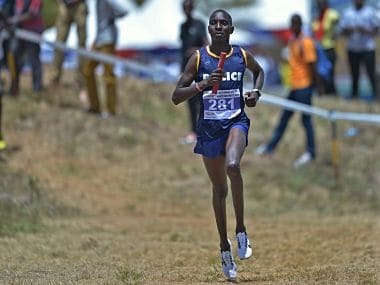 After the bronze medal finish in the Asian Athletic Championships in Bhubaneswar, Kang while speaking to a group of reporters, said, “I will be in the final in London.” There was a few seconds of silence as everybody came to grips with the import of what Kang had said. Kang’s bravado is endearing. He dreams of standing on the podium, a space no Indian has ever occupied in the javelin. Kang would do good to take some inspiration from the Turkish runner Ramil Guliyev who won the 200m beating the Olympic and World Champion, Wayde van Niekerk. Ramil gave Turkey its first ever World Championship gold. A slight gust of wind, a good release speed combined with an exceptional release angle and who knows, Kang’s dream might be our dream fulfilled.